In the late 1990′s I hosted a fashion segment on a jazz program on the local cable channel. 2004 I took designers to Federal Plaza Court of international Trade. 2005 a group show of local events and one large events. The local events attracted over 2000 attendees and everyone sold! 2006 I conceptualized and organized a trade show that put designers in front of Macy’s. 2010 Brooklyn Fashion Week proved that the traditional fashion show was extremely expensive for local designers. While private test showed we could stream to buyers way before anyone else pursued! As we explore we’ll look at the challenges and opportunities for artisans in the social, local, global and mobile setting! The challenge was not the technology… the challenge was and will be getting independent makers truly independent! Many have fogotten the end goal “selling their product to customers” and are caught in the adrenaline they encounter on “the route to achieving that goal”… seeking press and putting on fashion shows! In part 2 I’ll round of a report on that year and where I’m at now! 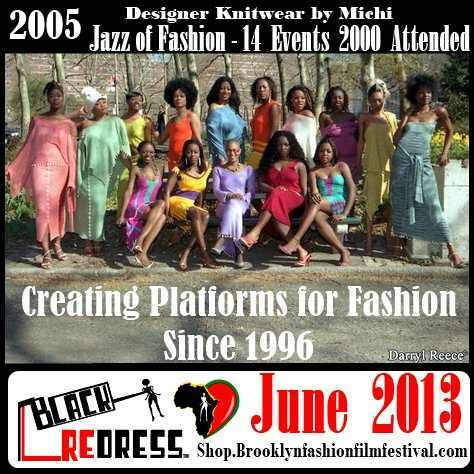 In 2011 We embrace a new way of practicing the Business of Fashion… we kick of in February with a focus on the Black Fashion Designers during NY Black History Month Celebration! During NY Fashion and Market weeks we add Brooklyn designers! Please note however we embrace ALL Independent designers to our 28 squared program! in 2010 we tested the technology for Live streaming Clothing (It’s not just turning on the camera) and connected with designers within the African diaspora (better known as Black Fashion Designers or designers of Color) we Got that down to a simple formula ( which we are currently revising for publication) with just a few queries! Now it was time for logistics and content and context! Do we use Skype or Gmail or a private network! Which will work best if not in all in most of the locales given various states of infrastructure & development! If a designer in Nigeria gets an order in Trinidad or vice versa which is the most economic way of delivery! How do we collectively take care of our communities while engaging in Global Trade! What of the Gate keepers do we need them! If the consumer is my neighbor or (my colleagues) who I can reach with a “Blast”- from our network… do I need to be on the cover of VOGUE… do I need $56,000 to be part of a fashion week! What about awards… if we have our own who needs BET! Radical… no it’s being done in many sectors from journalism to Mainstream fashion! What may be radical is he “power to the People’ Attitude we embrace! Even that the P2P movement is not new… it is however even new to our culture! We welcome ALL Independent designers – submit to Join me! The context – designing to meet particular needs or “ingestion” by Specific consumers! Really a matter of brand specific STYLE that each designer will ultimately define! our job within this is constantly reminding them of ALL the constituents! Changing the very interaction with customer, Platforms for showcasing and sale; as well as how it is affecting the Locale indie culture of designers, photographers, people in local social design circle; find inspiration to produce…design; work and sell. How is social Media widening Global Commerce; how it is changing the face (and specs) of the consumers; Even how it is s it changing the brand and aesthetic and style of these designer. The growing Fashion Tourism movement! Looking at Intro by designers as to what sets the style in their local apart with supporting video and images of their local sector as well as designers collections,. One designer may show items from his studio as he/she would in a distance presentation! Discussion on their use of Social media how that is changing the way they design, produce, sell… and how they handle the challenges… what would they improve on the apps they use. What are the payoff! Local conversation- Speaker are designers, photographers, people in our social design circle! Listening in and asking question will be consumers! Outside of the larger “fashion Weeks’ Designers can and we have used social media to communicate design do business and sell! Posted in Latest and tagged Design Innovation, Past Articles, Social Commerce, Social Styles.